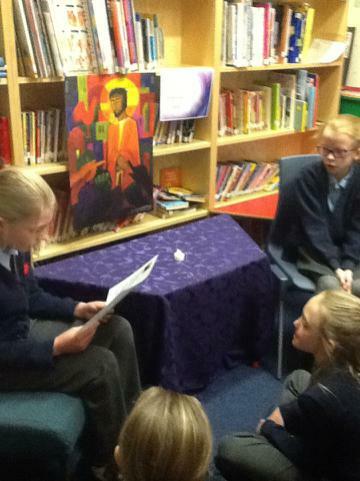 Year 6 told the journey that Jesus took on Good Friday when he was put on the cross. 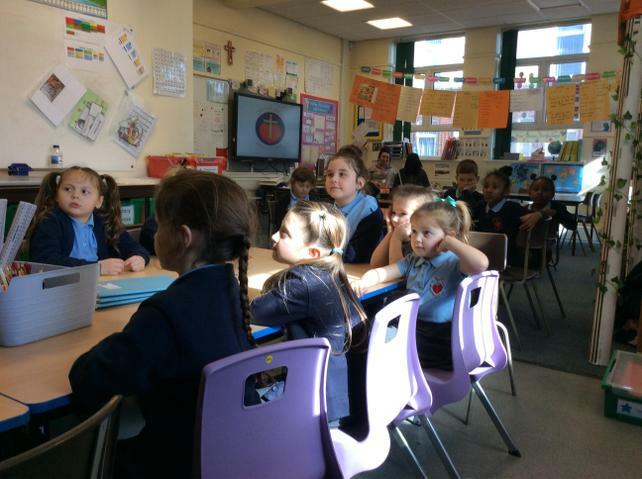 Each class travelled around school, visiting the different stations to hear the sad story. 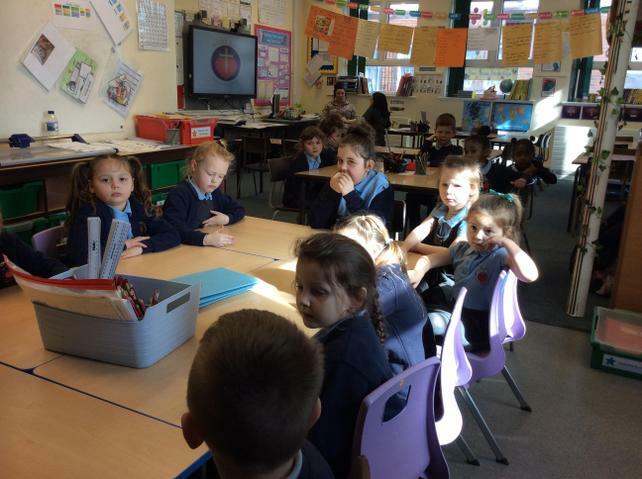 Class 1 helped tell the story about Jesus and his friends at the Last Supper. Jesus washed the disciples feet to show them that he was just the same as them. He broke the bread and shared it with his friends, telling them that the bread is to remember his body. Jesus shared wine with his friends, telling them that the red wine is to remember his blood. 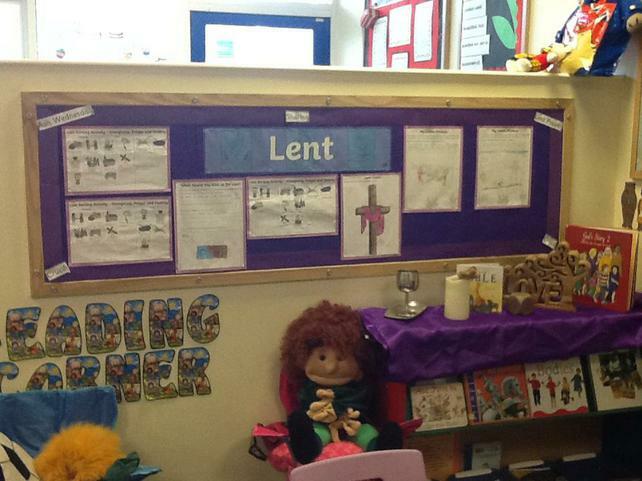 Foundation 1 helped us to tell the story of what happened to Jesus on Palm Sunday. 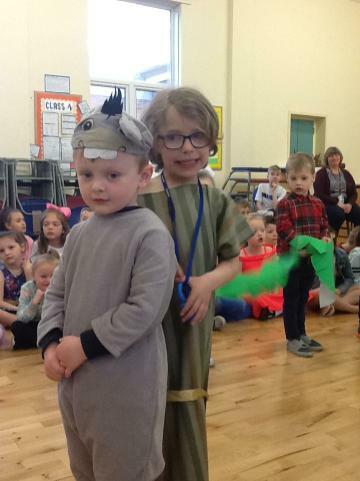 We heard all about Jesus sending his friends to go and borrow a donkey. Jesus rode into Jerusalem on the donkey and the people waved palm branches to welcome him. 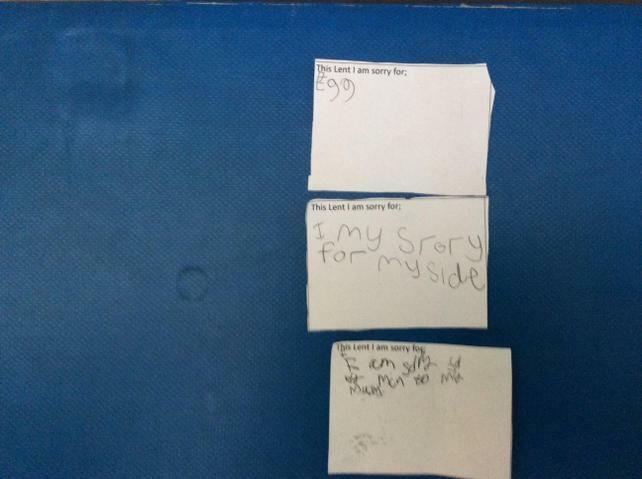 For the final prayer group session in Lent, the children thought about what happened to Jesus after the Last Supper. 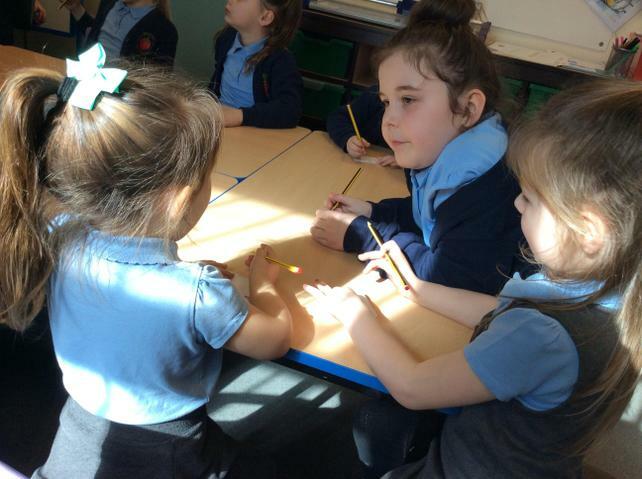 They talked about how Jesus had died on the cross for us and asked us to follow Jesus and show our love to people around us. 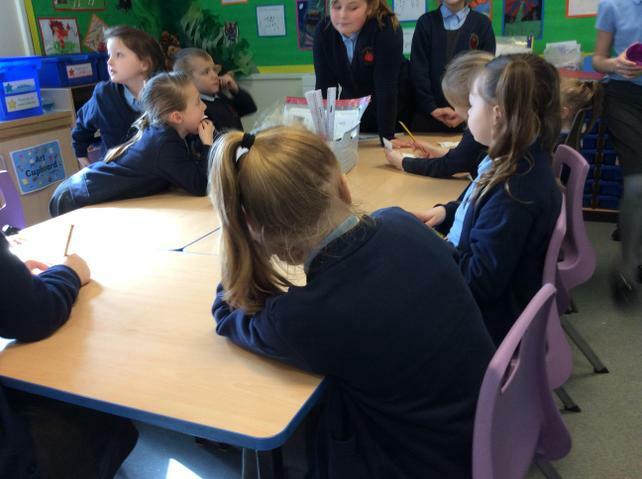 Today the children discussed Ash Wednesday and Lent, what they could give up for Lent and how they could try 'give back' or ''give alms' by making better choices and decisions in their every day lives and showing love to all. 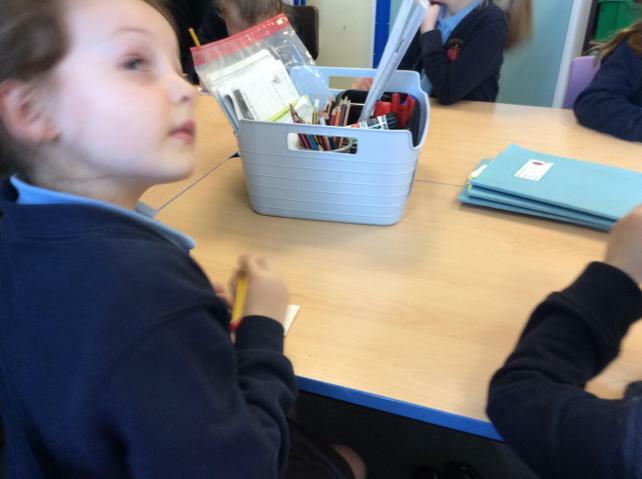 Today we talked about people who need our prayers due to them feeling ill or sad. 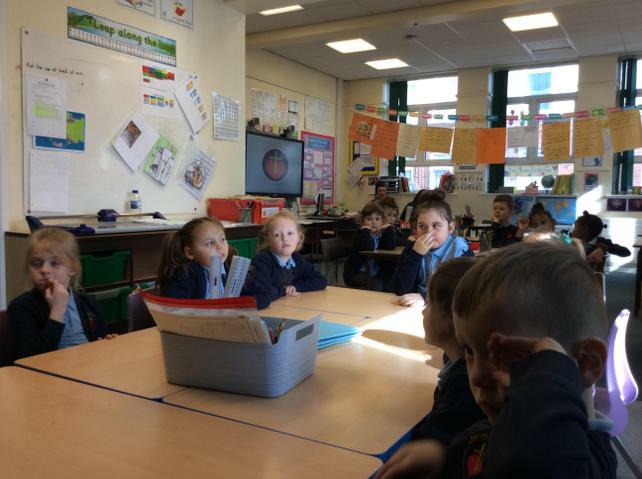 We listened to the reading from Matthew, Chapter 9 which told us about Jesus travelling through the towns and villages healing people. The people were like sheep and Jesus was their shepherd. Dear Jesus, please send your strength and love to all those who are sick. We ask you to heal the hearts and minds of all those who need your help. Amen. 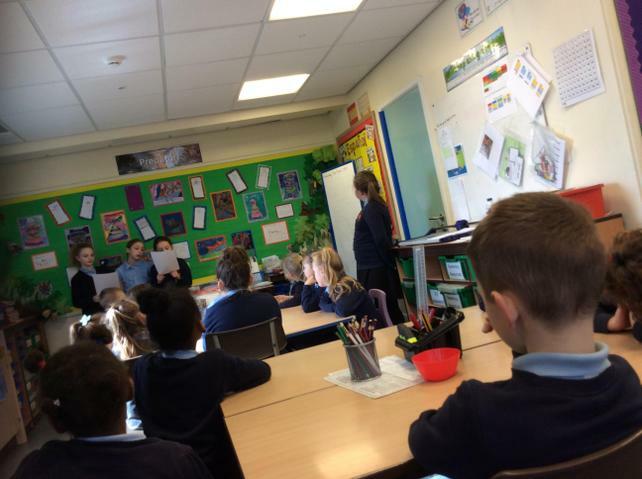 Today's session was linked to Holocaust Memorial Day. 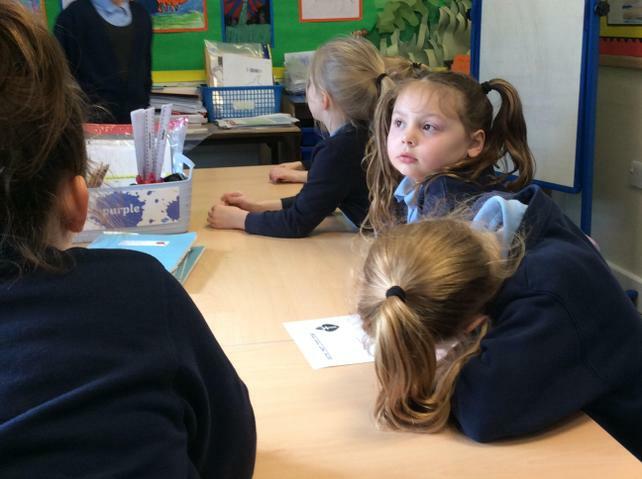 We talked about how people are judged because of the beliefs, cultures, abilities and talents. 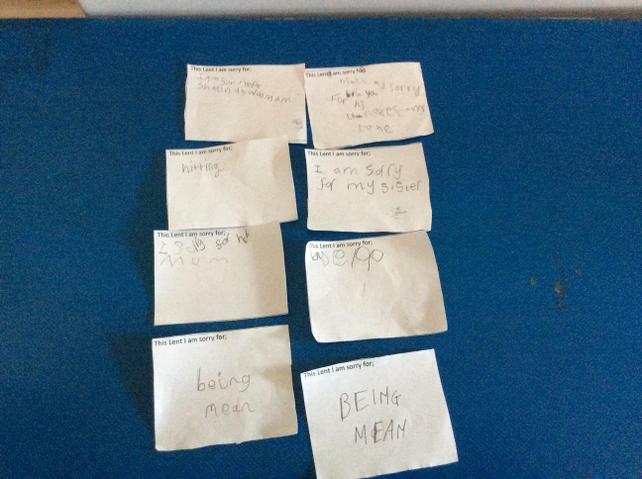 We all thought about our good qualities and what makes us a good person to others. 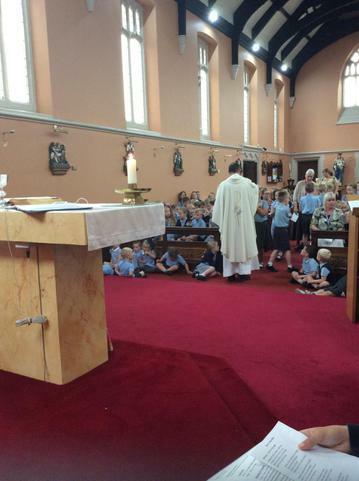 We all attended the parish Mass on Friday morning. 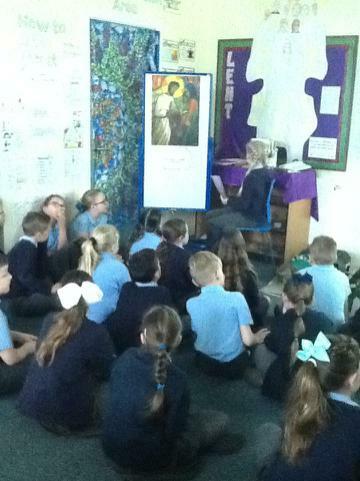 We heard how Saint Paul travelled around, preaching, spreading the word of Jesus. During our prayers we asked God to help us to be better people by guiding us to always make the right choices and do the right things, so that we can follow in Jesus' footsteps. 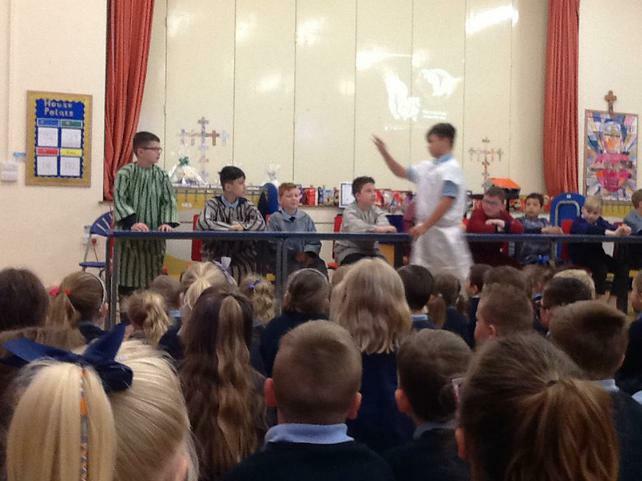 We started the new term with our Epiphany service. 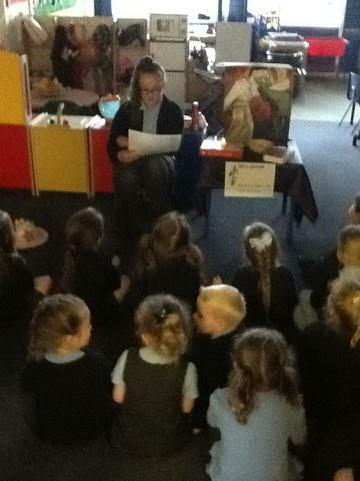 We heard all about how the wise men travelled to worship the baby Jesus. 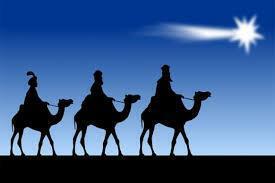 They followed a star that lead them to the Messiah and presented him with gifts of gold, frankincense and myrrh. Gold was a precious and expensive gift, and showed how important Jesus was. Frankincense is a sweet perfume which was often burned in the temple to worship God. Myrrh was used to keep things fresh and put on Jesus' body when he died. By bringing it as a gift to Jesus, the wise men foretold his suffering and death. 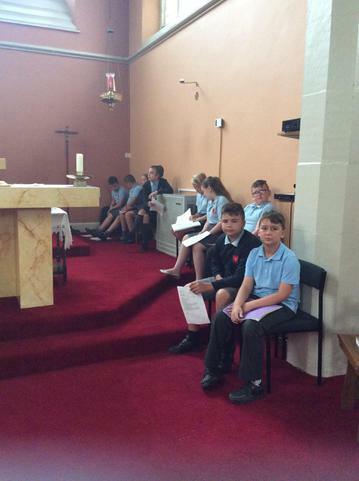 We all went into church for our Advent Mass. 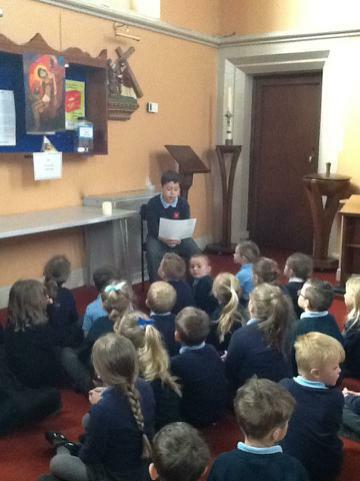 The Mass was led by Father Declan and Class 5. 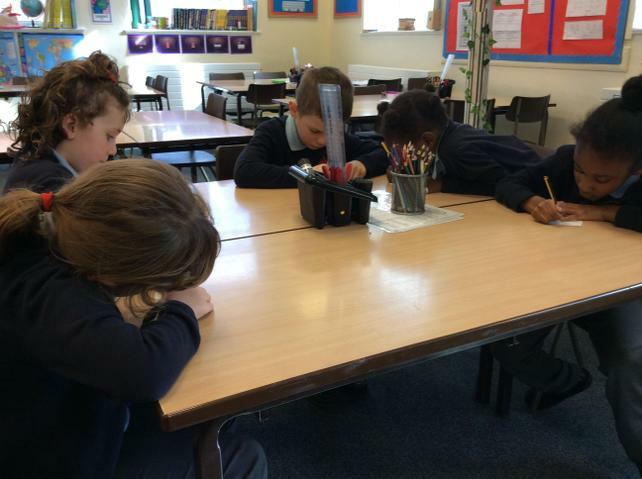 We heard all about how Mary and Joseph prepared for the arrival of Jesus and we prayed to Jesus to fill our hearts with his love. Advent is a time when we remember Gods greatest gift to us, his only Son. 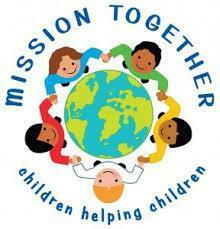 Mission Together is a charity that was started by a French priest over 150 years ago. 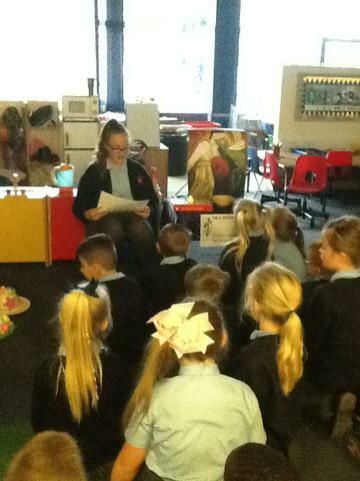 Mrs Barry came into school to tell us about the work that Mission Together is currently doing. This year, the charity is focusing on helping refugee children in Jordan. 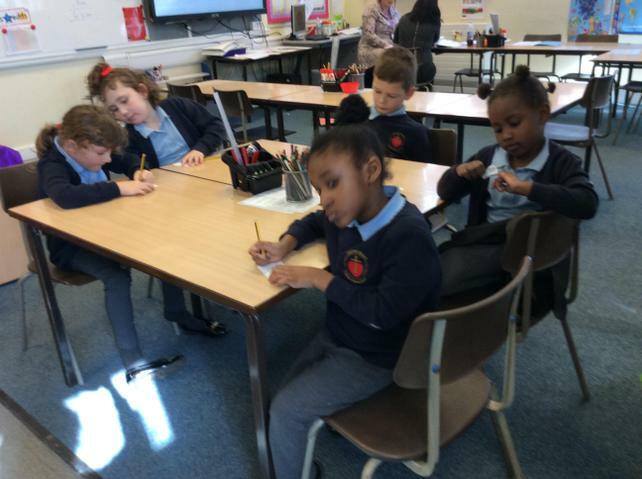 We helped raise money to support a school for refugee children. 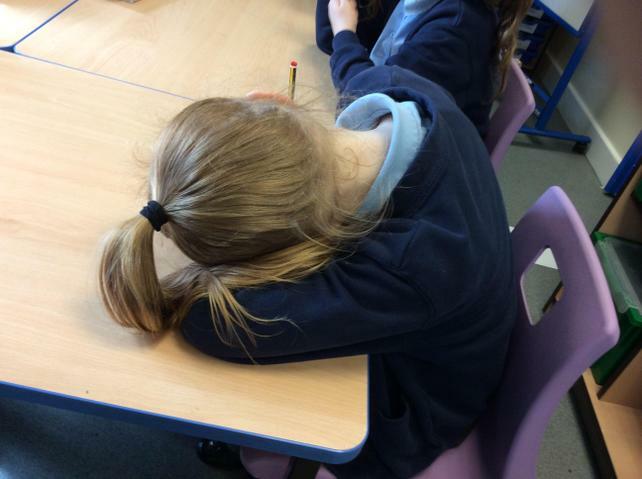 The school opens in the afternoons. We heard about a girl called Sandra, who is from Baghdad, and how she is benefitting from being able to attend the school. Our money will go towards helping to ensure that the school can remain open to children like Sandra. We presented Mrs Barry with a cheque for Mission Together from all of the staff, parents and pupils at Sacred Heart. 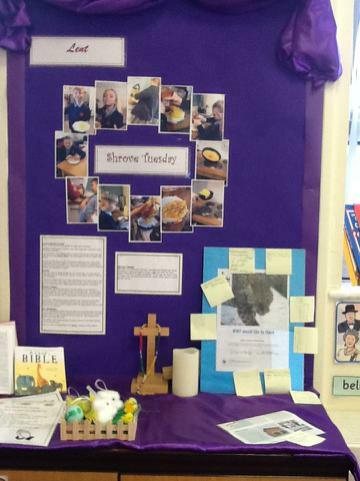 Today we looked at the different parts of the Advent wreath and what they symbolise. The leaves are from evergreen plants to remind us that God's love is always there. The holly leaves are sharp like the crown of thorns that Jesus wore and the red berries remind us of the blood that Jesus shed. The wreath is a circle that never ends. 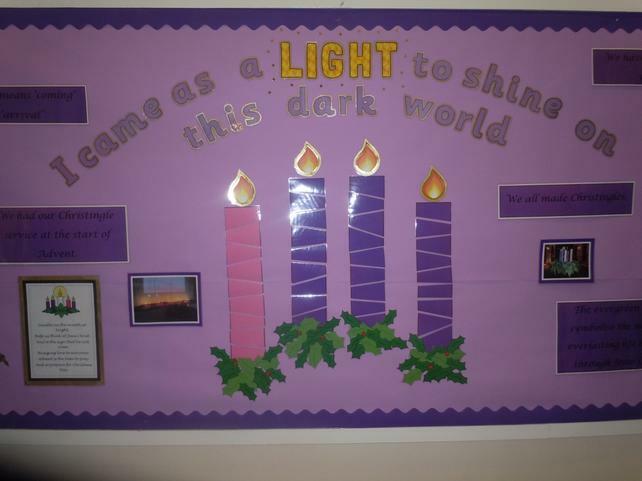 The candles represent the four Sundays in Advent and the white candle reminds us that Jesus is the light of the world. Advent means getting ready for something special. 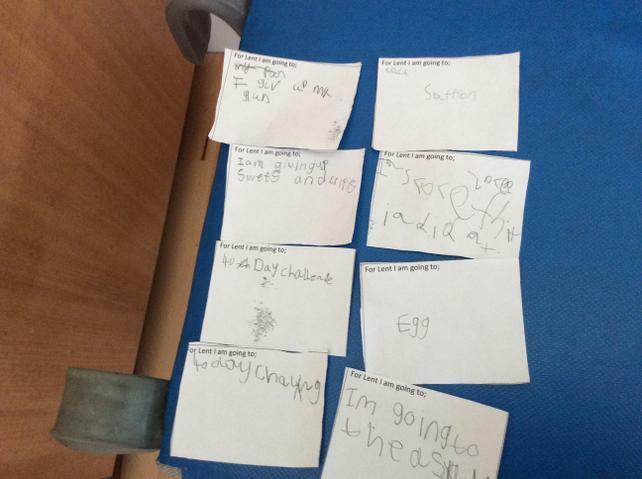 During prayer group we thought about how we are going to prepare for Jesus' birthday. 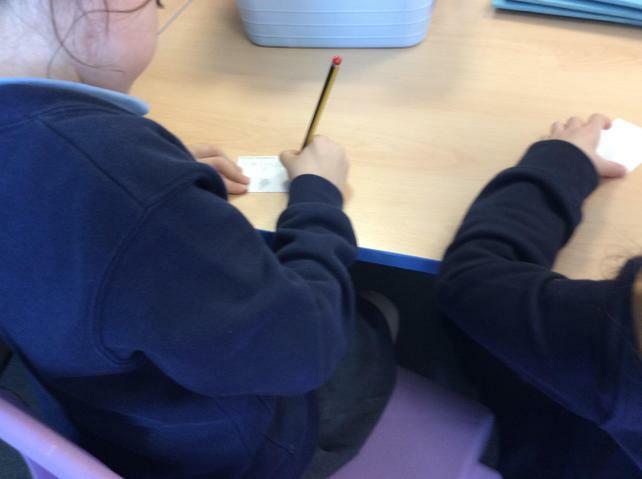 We thought about the ways in which we can help other people. We created an Advent paper chain showing how we are going to get ready for Jesus's birthday. During our prayer we included people who might be feeling alone at this time of year and those who do not have a loving family around to support them. 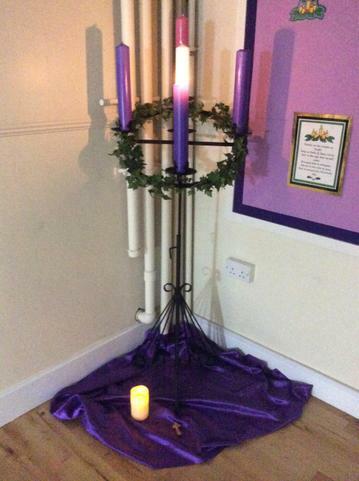 We also lit the first candle on our Advent wreath. 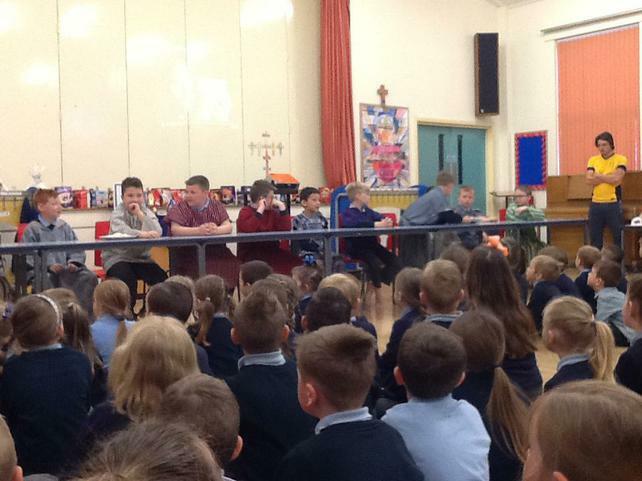 Parents were invited to join us for our Christingle service. 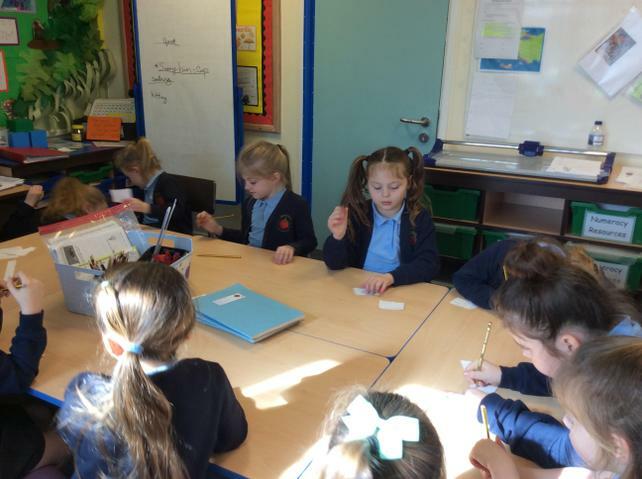 Every child made their own Christingle. The word Christingle means 'light of Christ'. The orange reminds us of the world God created. The candle symbolises that Jesus came to give light to the world, bringing hope to people living in darkness. The red ribbon around the Christingle reminds us of the blood that Jesus gave for our sake. 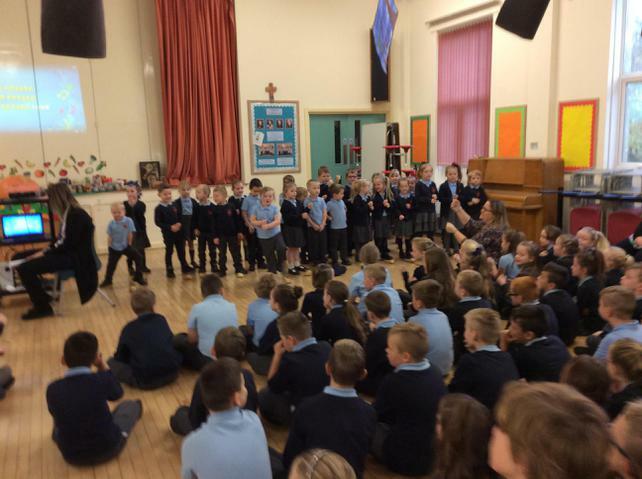 Father Declan joined us for our first Advent assembly. 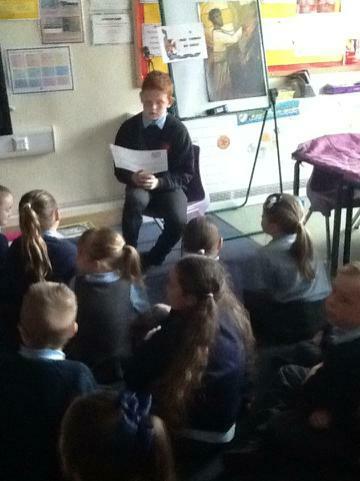 Some children shared readings and led prayers. 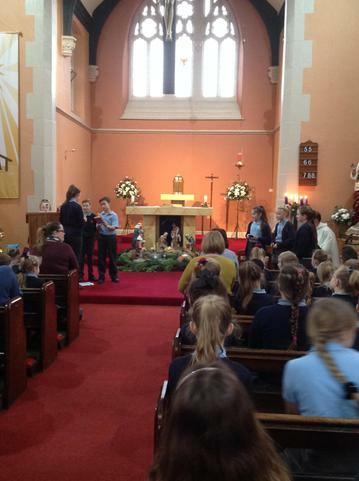 Father Declan blessed our Advent wreaths and the wreaths were taken into each class. 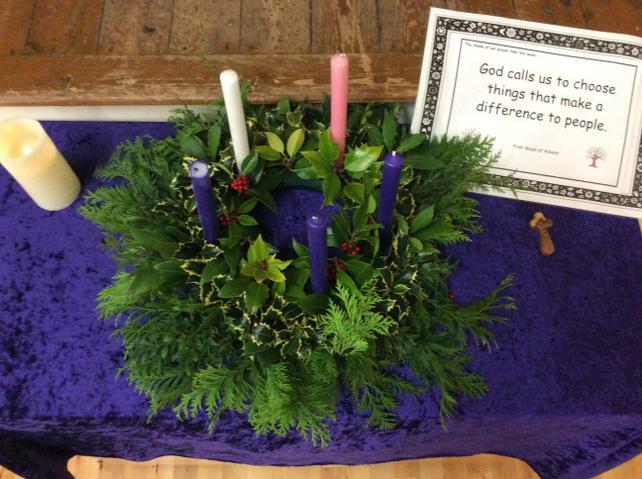 We have made Advent wreaths for each class. The wreath is a circle with no beginning and no end - just like God's love for us. It is made of evergreen leaves to show that God's love for us is everlasting. The four candles represent the four weeks of Advent. The fifth white candle is to remind us of Jesus. The lighting of the candles reminds us of Jesus Christ, light of the world. The focus of today's session was about being thankful for everything that we have in our lives. The prayer group leaders read a reading from Luke, Chapter 12. Everyone thought about what they had in their lives which was special and precious. 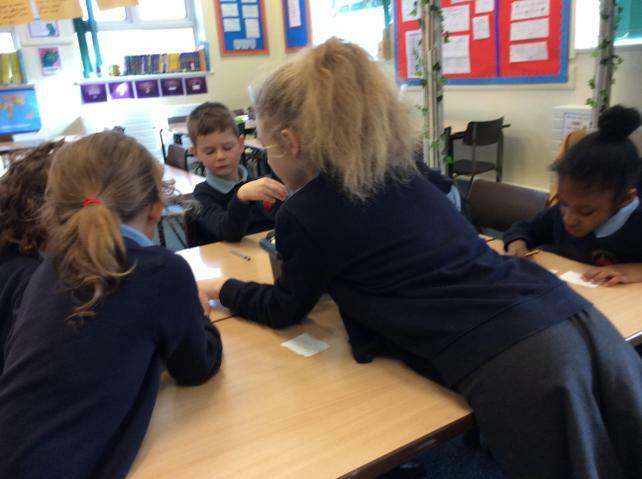 The group created a 'meaning tree'. 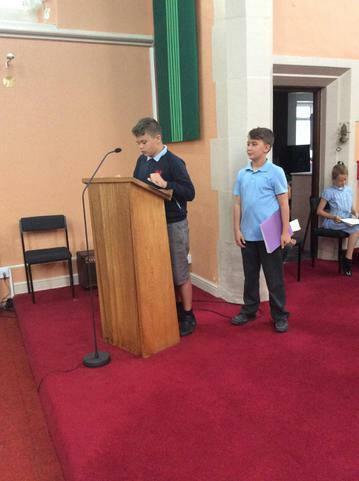 Today was Class 5's final Church visit at Sacred Heart - their Leaver's Mass. 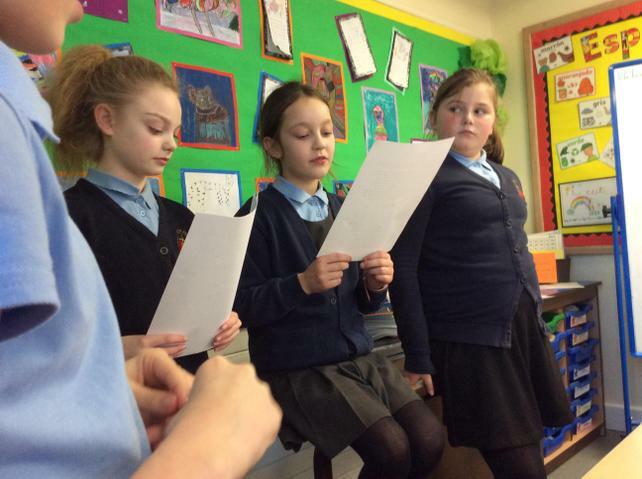 The whole school took part, which was led by Class 5, who recited readings and prayers. 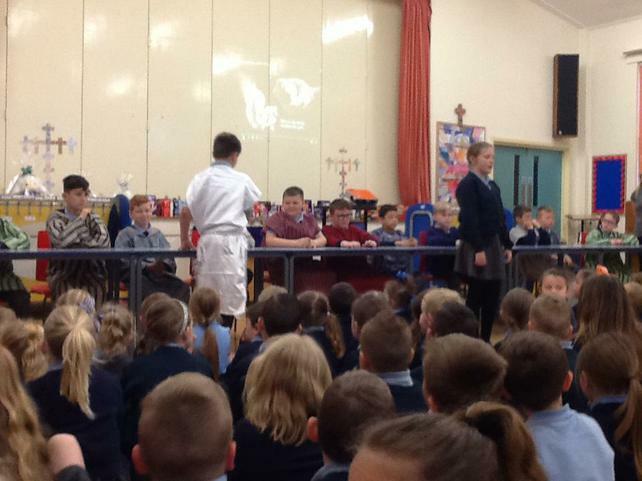 We celebrated their efforts and achievements, not just throughout the year, but our whole time here at Sacred Heart. 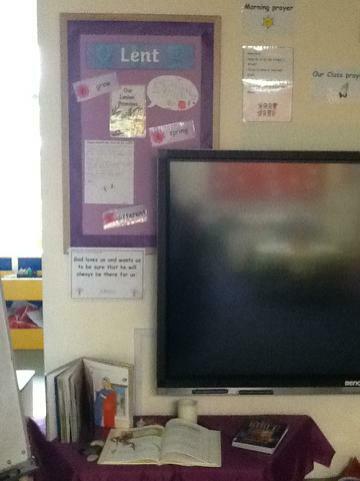 They then shared our favourite memories, pieces of work and achievements from our time here. 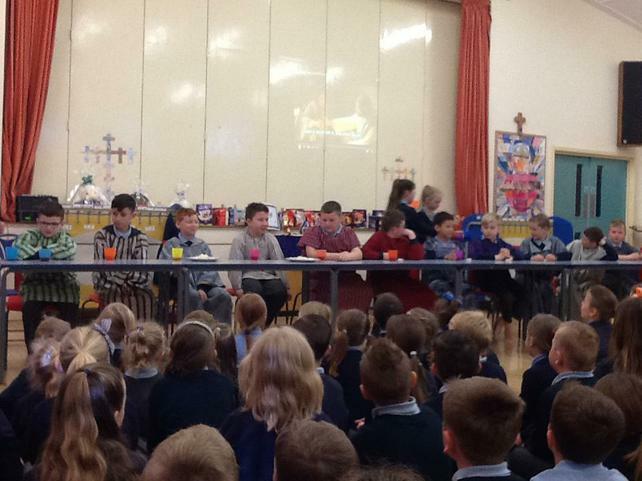 Class 5 led our Epiphany Mass in church. 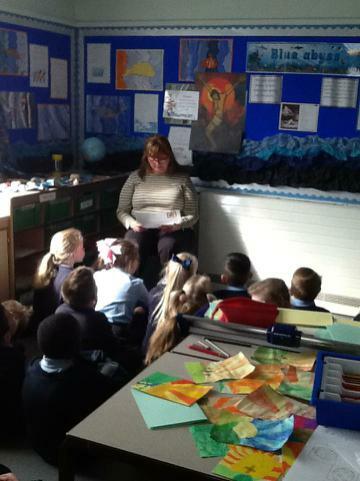 We heard all about the special visitors who followed the star to visit Jesus. 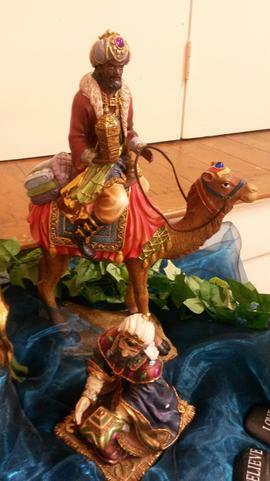 They travelled a long way to give their gifts of gold, frankincense and myrrh. 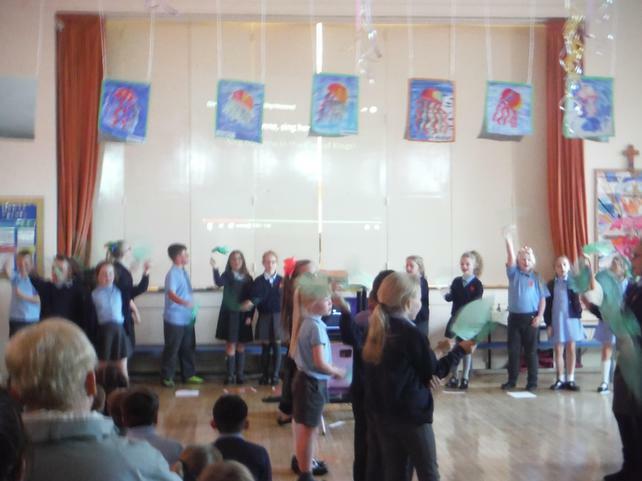 Our school choir treated us to a festive performance of Christmas carols in the hall. 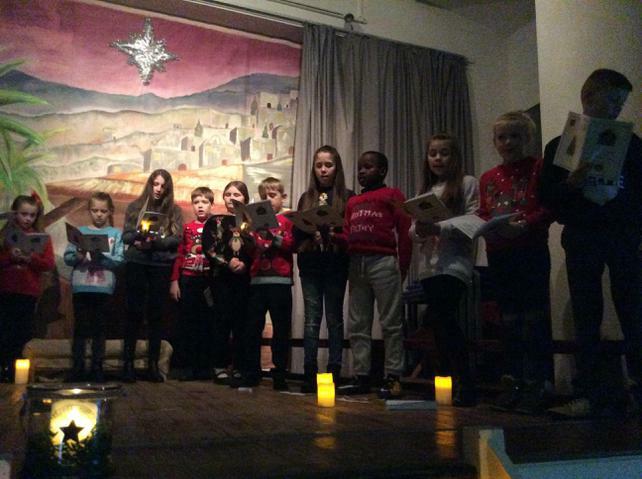 The choir sang a range of carols and did readings to tell us the story of that very first Christmas when Jesus was born. 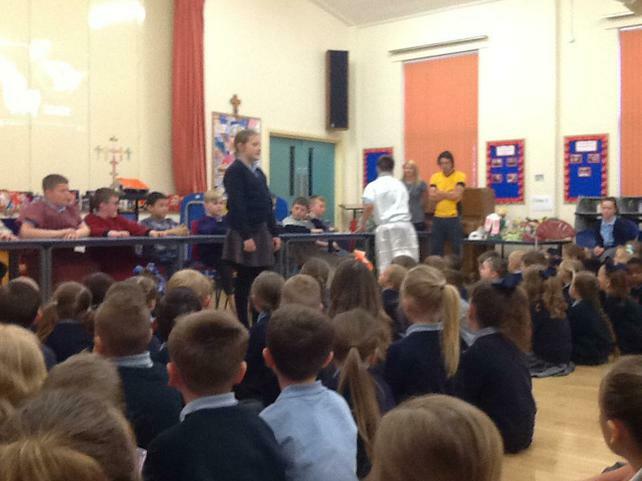 We had our Christingle service during the first week of Advent. 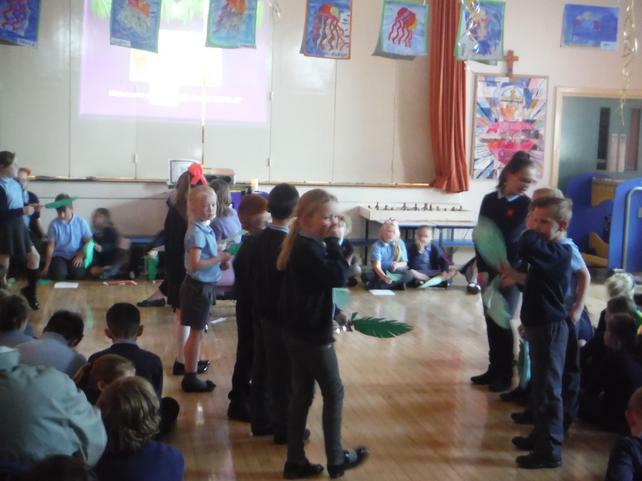 All of the children made a Christingle and Class 2 led the service, with parents joining us. The word Christingle means 'light of Christ'. The orange is to remind us of the world God created. The candle symbolises that Jesus is the light of the world and the red ribbon reminds us of the blood that Jesus gave for our sake. The four cocktail sticks remind us of the four seasons of the year and the four weeks that we take to prepare for Jesus birthday. The fruit shows us all of the good things that God gave us. 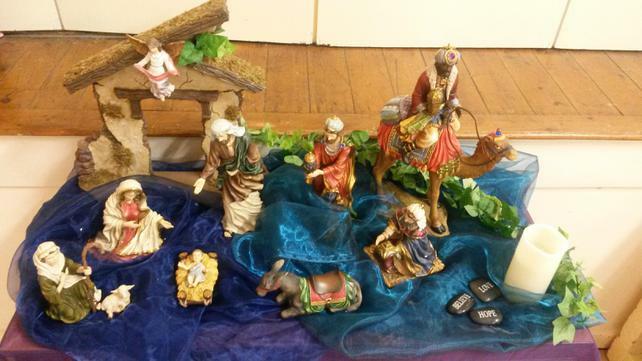 The St Pius Travelling Crib has arrived at Sacred Heart. 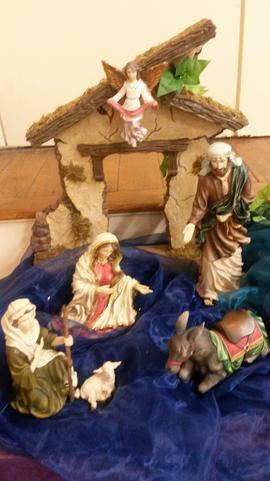 The crib is visiting all of the schools in our learning community. 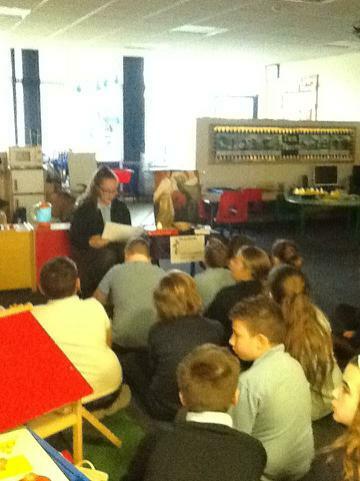 In assembly we found about the first Christmas when Jesus was born. 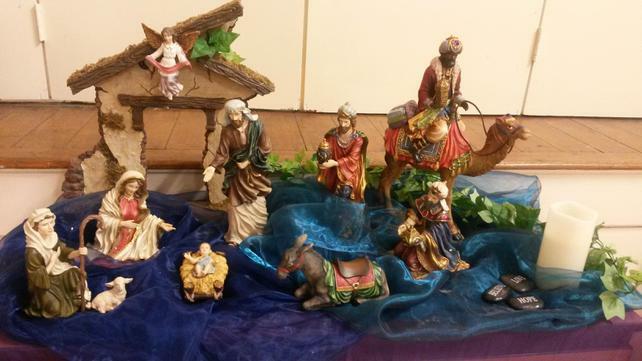 Our advent preparations have already begun as we prepare to celebrate Jesus' birthday. Thank you to everyone who donated tins of food to our harvest food collection. It was lovely to have so many parents join us at our harvest celebration. Your food donations will be shared between the Salvation Army and St Wilfrid's Centre in Sheffield. 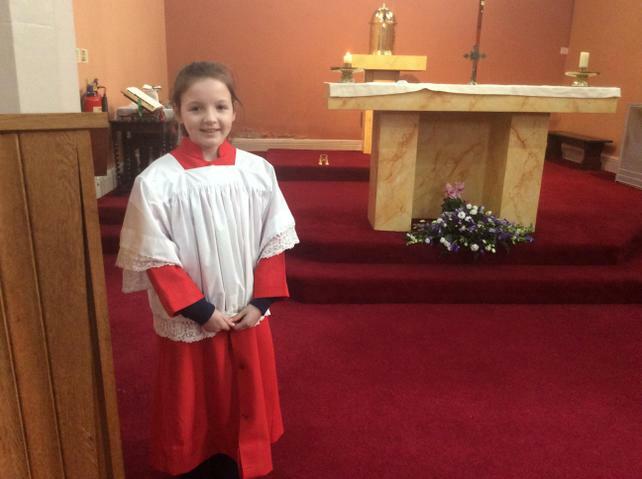 Some of our pupils celebrated their First Holy Communion at St Michael's Catholic Church, Wombwell. They were joined by staff, family and friends. Father Chris led the service on this very special occasion. 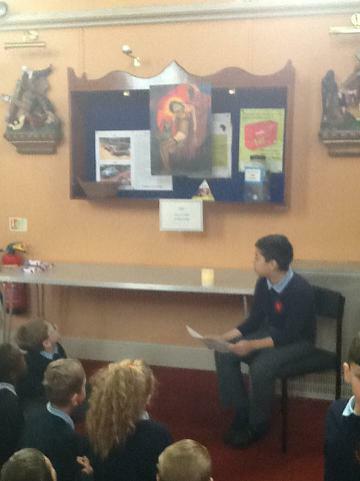 Class 3's liturgy was based on Pentecost. 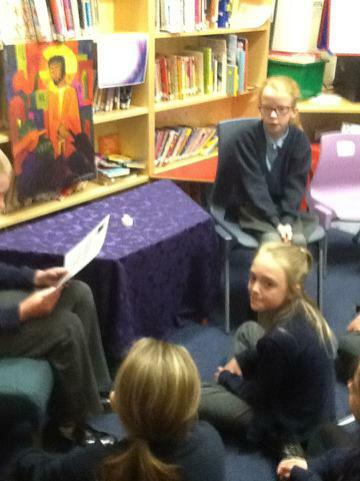 Children talked about what happened at Pentecost and how the Holy Spirit affects our lives. Parents were invited to join us in church. During May we thought about Mary, Jesus' mother. 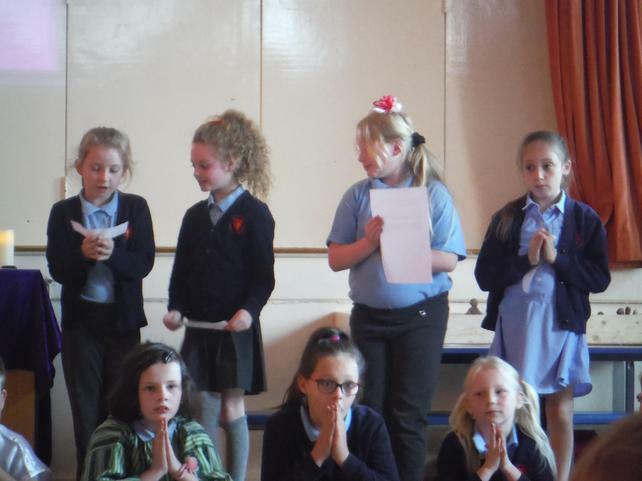 We included special prayers about Mary in our Collective Worship. Mary is a symbol of new life and the start of summer. 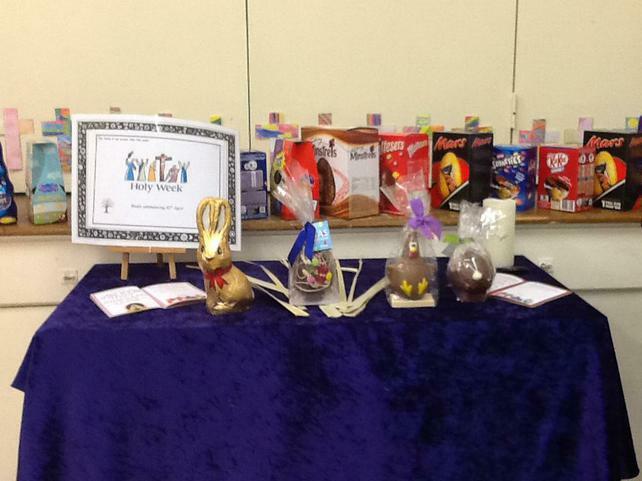 Some of the money that the children raise during Lent goes towards The Good Shepherd. This is a caring service provided by the church for everyone. 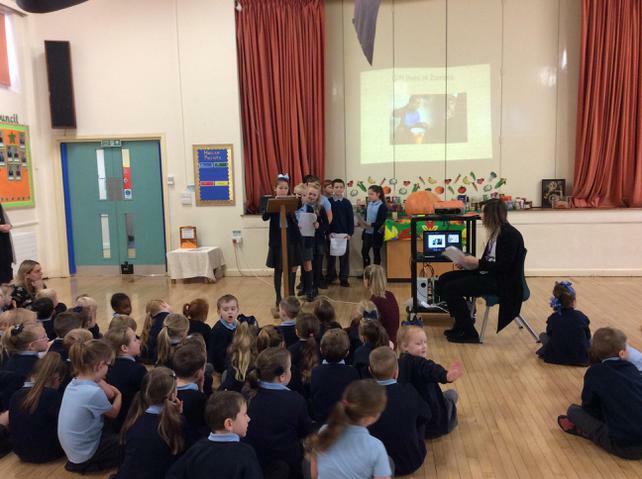 Some children from all three of our Federation schools went to the Good Shepherd service in Sheffield. 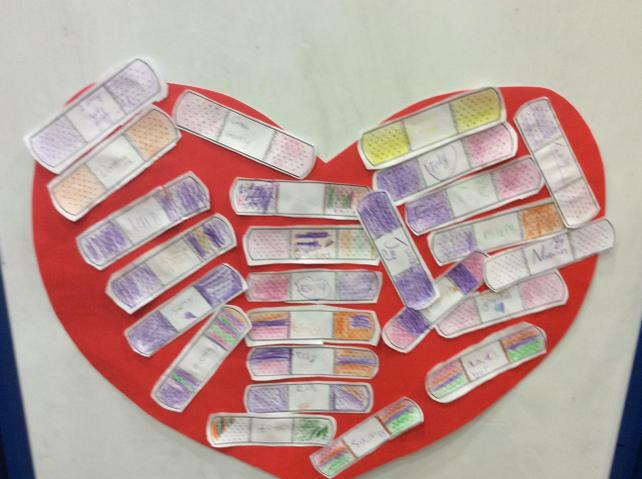 Sacred Heart children made the banners for our Federation. During the service we presented a cheque to Bishop Ralph. The theme of the service was Our Lady. 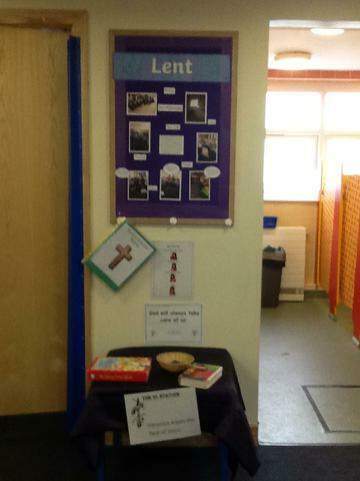 We began Lent with our Ash Wednesday service. The ashes were made from last year's palm crosses and they had been blessed in church. An ash cross was placed on the forehead of all children and staff. 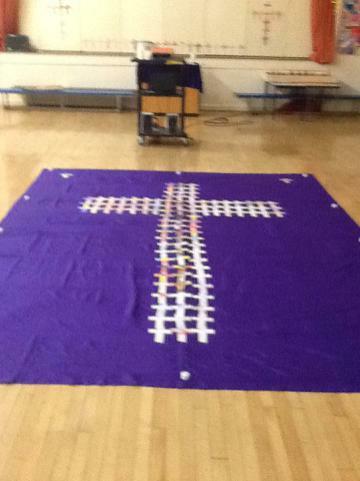 Throughout Lent each class had their own "Travelling Cross". 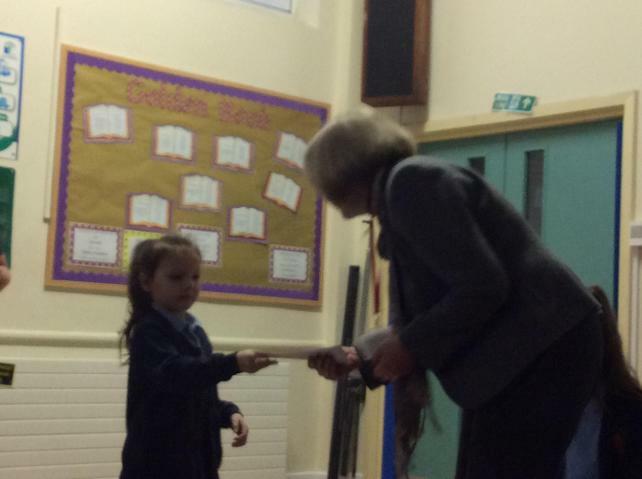 Children had the opportunity to take the travelling cross home with them. 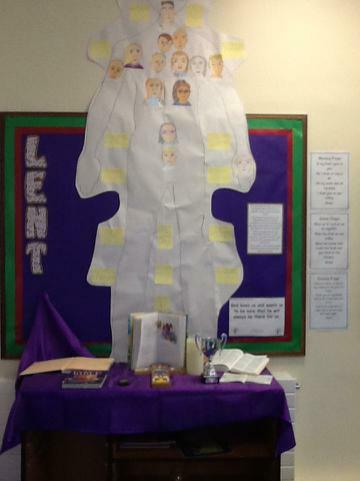 Children wrote their own Lenten prayer at home with their family. 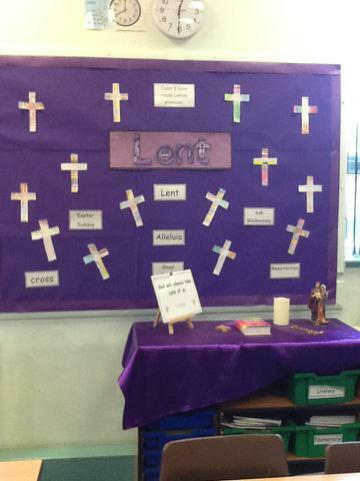 Each class had their own special display throughout Lent. 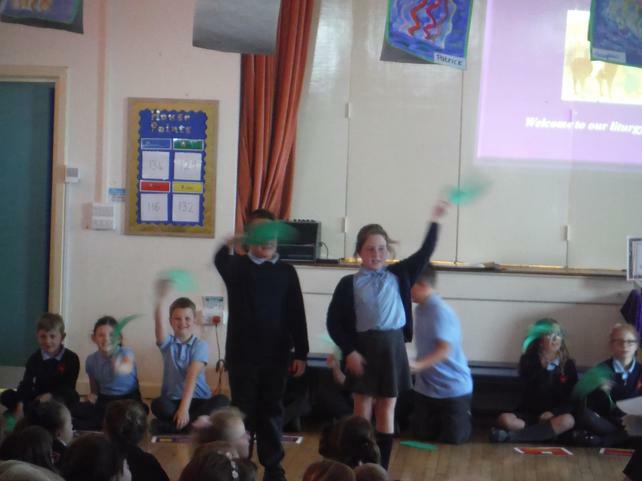 Class 3 led our Palm Sunday service at the start of Holy Week. Parents were invited to join us. 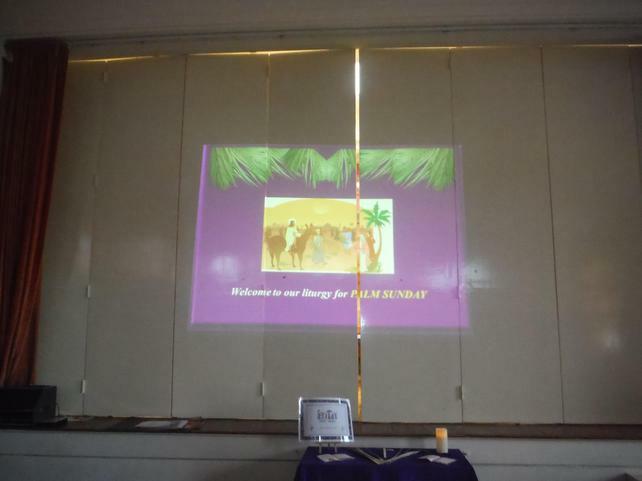 The children told the story of how Jesus rode into Jerusalem on his donkey and he was greeted by crowds of people waving palm branches. 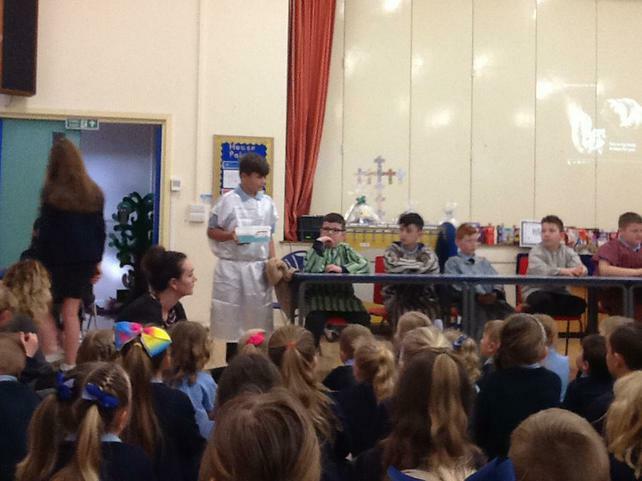 Class 4 told us all about the Last Supper. Jesus broke the bread and shared it with the disciples. The bread was to remind them about Jesus' body. Following this, Jesus gave each of the disciples a sip of wine. The red wine was to remember Jesus' blood. 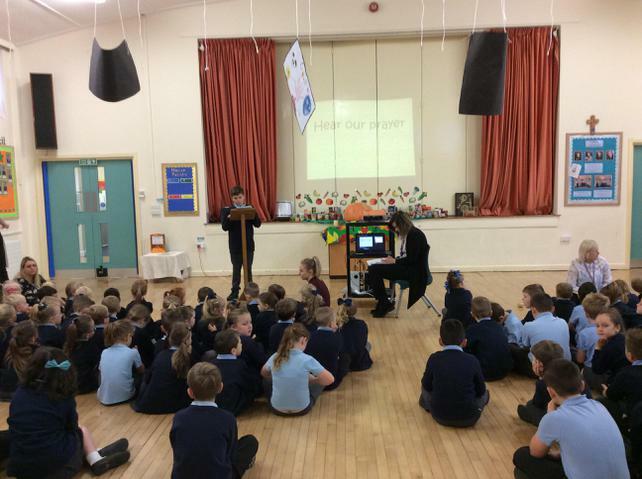 During Holy Week all of the children went on a journey around school visiting the stations of the cross and praying at each one. 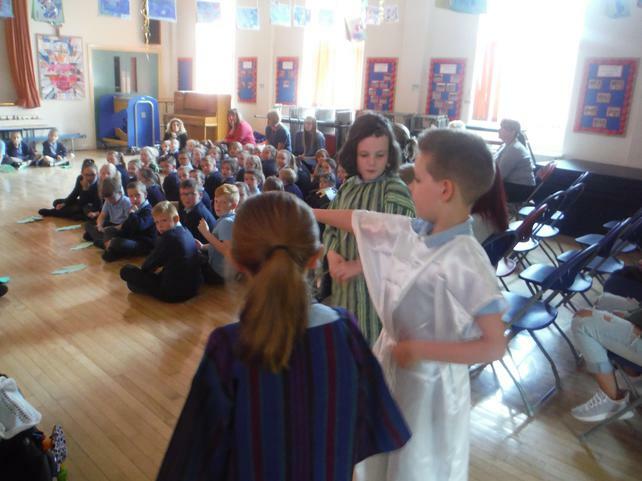 Throughout the journey children found out what happened to Jesus. Jesus was nailed to the cross on Good Friday. Our journey finished in church. We made Advent wreaths in preparation for the start of Advent. Advent means "coming". 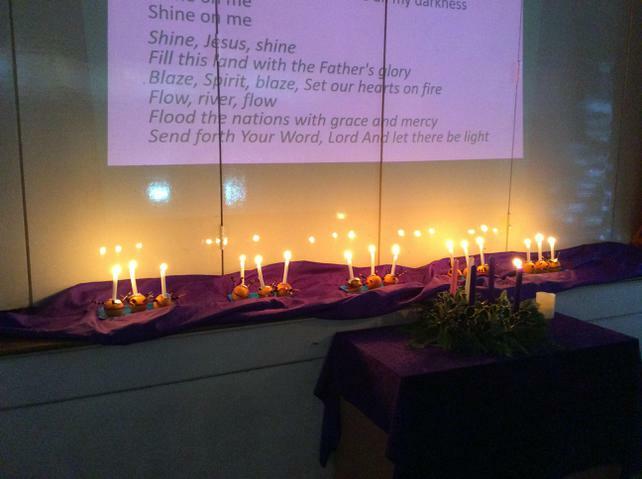 The purple candles are lit on the first, second and fourth Sunday in Advent. 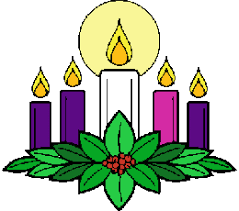 The pink candle is lit on the first, second and fourth Sunday in Advent. 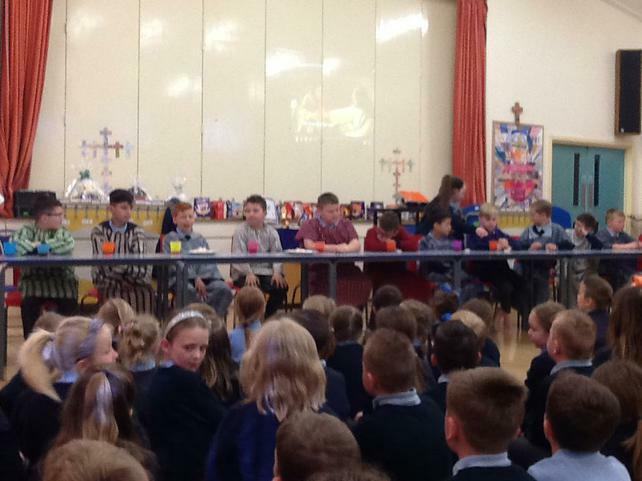 At the start of Advent we held our Christingle service. 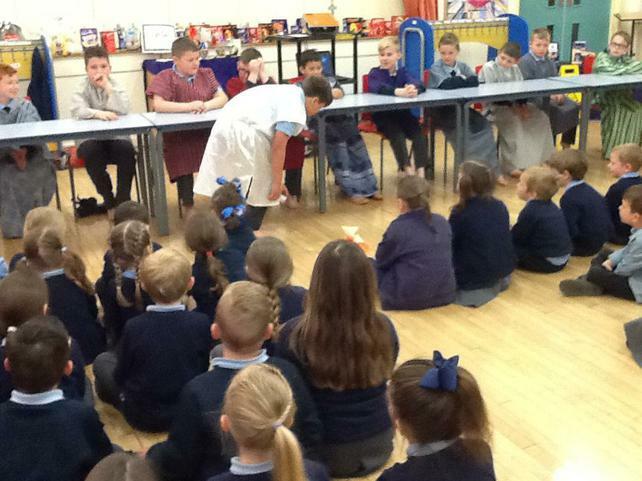 Every child made a Christingle. The orange is to remind us of the world. The red ribbon reminds us that God's love goes all around the world and that Jesus died on the cross. 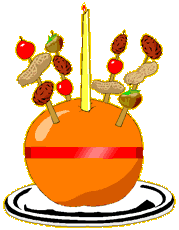 The four cocktail sticks represent the four seasons and the fruits of the earth. The candle symbolises Jesus, the light of the world, who brings hope to people living in darkness. Parents joined us for our Christingle service at the start of Advent. 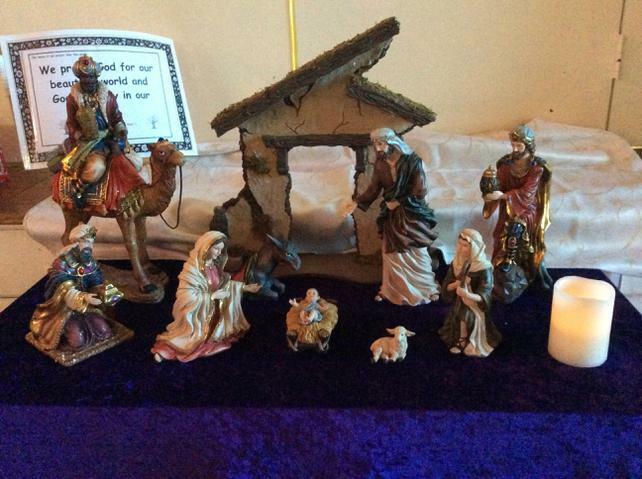 The Learning Community travelling crib came to Sacred Heart at the start of Advent. 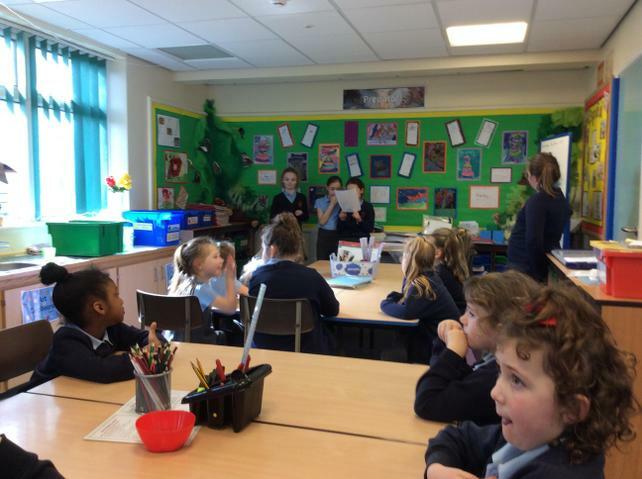 The children heard the story of the first Christmas when Jesus was born. 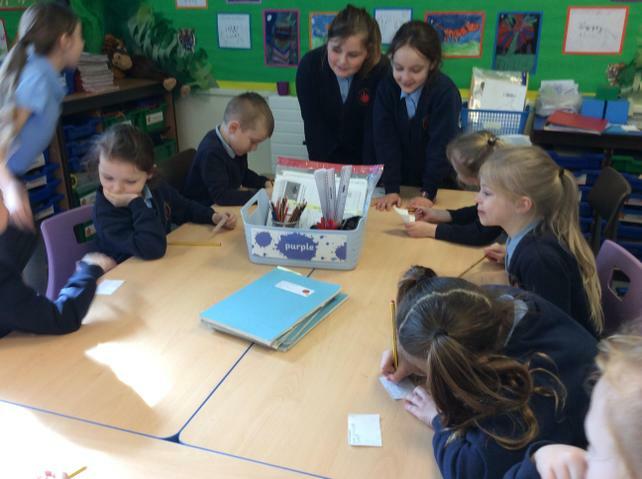 They found out who visited Baby Jesus and what gifts they brought him. The crib travelled from school to school, visiting all of the schools in our Learning Community. 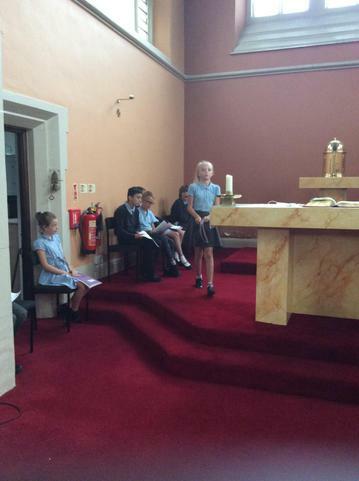 Some Year 4 pupils attended the Mission Together Mass at Holy Rood Catholic Church in Barnsley. The Mass was led by Bishop Ralph.